InsideSales.com is a software company who created what they call a "sales acceleration platform" built on Neuralytics. In layman's terms, it means that they use fancy behind-the-scenes technology to passively analyze your workflow and prompt behaviors to maximize sales activities. 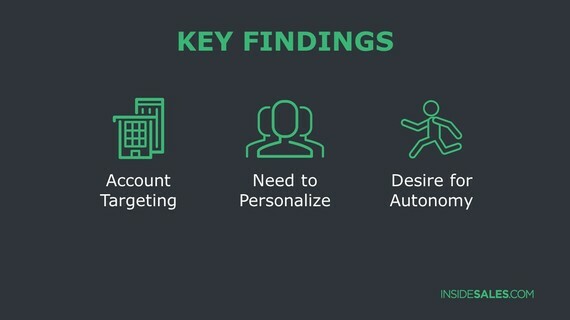 Used by companies such as ADP, Microsoft, and Groupon, the platform fuels sales rep performance and provides buyer personalization with breakthrough innovations in predictive sales communications, engagement tracking, forecasting, and rep motivation. 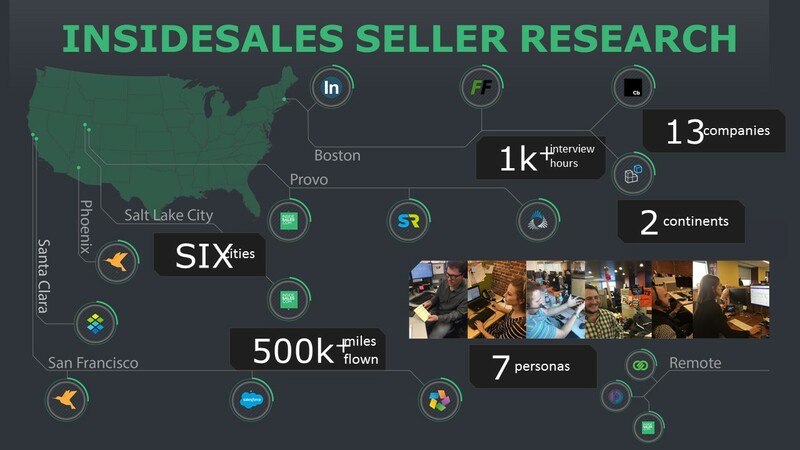 InsideSales.com has received numerous accolades for its technology, including being named to the CNBC Disruptor 50 and Forbes Cloud 100 lists, and earning recognition as one of the fastest growing companies, per Inc Magazine. Dave Elkington, CEO and Founder at InsideSales.com, explains, "We are a company that is enamored with data. We are always digging in and analyzing behavioral trends and how people are influenced by what is happening in the environment around them; everything from rain, gas prices, or even a win by a local sports team." About a year and a half ago, Elkington and his team noticed response patterns and behavioral patterns began to change; for one thing, utilization began to decline. Not massively, but enough that as a software company the alarms went off. After a small observational study suggested that their user profile was changing dramatically, they launched a broad study that included 170+ hours of interviews, traveling more than 500K miles across 13 companies and two continents. Elkington says, "What we found was 18 months ago we had a generational shift where more than half the selling workforce worldwide became Millennials. The people now selling at these large companies are largely under 26 and largely behave very differently than Boomers or Gen Xers. While you can find much data to support this, we actually SAW the shift in utilization. Our data tells us that the way they sell, behave, and go to work is not evolutionally different, it is revolutionally different." 1. They are self-directed. They want to be empowered with an objective and accomplish it however they want to. 2. They don't like to be constrained or forced to work within a box. They do not want to be told, "here's the piece of software, do this." 3. They are REALLY collaborative, but not as competitive. They like to share best practices. 4. They are non-linear. They are the epitome of multi-taskers. Now, when I look at this list, I think of a Boomer colleague of mine and his reactions to a similarly presented list of "what Millennials want." After each point, (i.e. "Millennials want to be empowered.") He would lean over and whisper, "I like to be empowered." Or "I don't like to be constrained..." While Millennials' revolutionary change in behavior is DRIVING the change, WE ALL benefit from the change. Elkington and his team found that Gen Xers and Boomers begin to emulate that same behavior and adopt new social norms. One specific example is engagement via texting. "We found that Millennials engage much more via SMS," says Elkington. "It can be something as simple as 'Hey, I have e mailed you the proposal, let me know if you have any questions.' The view is this: Once I have engaged with you, it is acceptable to text for a response rather than picking up the phone. It's not like you have to accommodate a Millennial, we found that there are simply new norms of how to engage with technology." While their research began looking at the work day, the InsideSales team quickly discovered that to truly understand this generation, they would have to look beyond the typical work day. Elkington says, "80% of Millennials go to sleep and wake up with their smart phone within 2-3 feet of them. Technology completely encompasses their entire work and life experiences. With the Millennial generation, more than any other, what we found was that there was a complete trust of technology and optimized machine learning. Associated with that there is a complete willingness to provide personal information with the promise of improved life (i.e. I share my personal information with you - such as where I am - and you tell me the optimal way to get to work). Because of this trust, they wake up to a predictably optimized time. They go on a predictably optimized run. They get coffee at a (Yelp recommended) predictably optimized bistro. They may get a predictably optimized lunch, then have predictably optimized television after work or do a predictably optimized workout at the gym." Right now, the workplace is probably the single most predominant place that is NOT predictably optimized. If you think of the largest consumer brands (Facebook, Amazon, Netflix, and Google) those organizations use massive amounts of crowd-sourced data to "predictably optimize life." We all get it, and like the benefits ... but, to be able to truly predictably-optimize things, you must have a LOT of data. The problem in the enterprise space is that no one customer has enough data to solve that problem; InsideSales has begun to crowd-source enterprise space data. Companies like Microsoft, ADP and, DELL are now helping one other; because only in aggregate is there enough data to predictably optimize work life. Unfortunately, when it comes to massive amounts of data, not all data is created equal. Especially with the Millennial generation and the new "online culture," we find that if people volunteer the data, it's bad data. For example, you would never say on LinkedIn, "I got fired because I stole a stapler." Instead, we say "Taking a sabbatical." On Facebook, instead of saying, "I am miserable and my husband just left me," we post a duckface photo from the Bahamas. We don't sneeze without tweeting about it, but just because we tweet doesn't make it true. Intentionally or not, people misrepresent themselves. Elkington believes that this is why the election results surprised so many, "The way traditional polling happened doesn't work today. If you ask people what time they get up on average, they may tell you 6am, but the Fitbit may suggest otherwise. There's an accuracy problem in self-reported data. The best and only way to get accurate data today is to observe it passively." Here is another generational shift: Millennials trust and share more than any other generation. They trust that companies will be responsible with their data and provide benefits (via predictable optimization) that fundamentally improve their life in return. As Millennials move into leadership roles, there will be more of this trust transferred to the corporate level. Elkington predicts that as technology companies figure out this passive data sourcing, and build trust that companies will "behave" with this data, we will see a "land rush" of workforce optimization, space optimization, and many new technologies to predictably optimize the workplace. Millennials are more tech-oriented than any generation and 80% believe new technology at work makes it easier to perform their tasks, so beyond new perks and benefits, businesses need to revamp their tech to build a strong, long-term workforce of the future. Based on these key preferences and behavioral patterns observed (need for more data, personalized tools, and more autonomy), InsideSales is one company that has built an entirely new product specifically designed for this generation. Playbooks allows Millennials in sales to increase efficiency, save time, and drive revenue in a process specifically tailored to them. It is the first solution of its kind to passively follow reps wherever they surf on the web, even across multiple browser tabs, giving immediate access to critical sales resources, no matter what website the rep is on. "What many of the tech giants are now discovering about AI is what, in many ways, we've been doing all along," says Elkington, "This is about science - including big data and AI technology - holding the key to unlocking human potential. To be clear, we're not talking about robots taking over sales jobs. What we envision with Playbooks, and the entire InsideSales platform, is a true sales revolution - a generation of sales reps who are better equipped, better informed, and more effective than any that has come before. And it's not going to wait until the future, it's happening now." This article originally published in the Below Press publication, Workplaces Magazine December 1, 2016. It is republished here with permission. About the author: Amanda Schneider, LEED AP is a workplace trends researcher, blogger for the Huffington Post, and the founder of Contract Consulting Group, a consulting practice serving the Contract Interiors Industry focused on market research, business strategy, and communications.